Saturday & Sunday June 8th - Labor Day. Unlimited rides noon-6:00 including Go karts, Mini golf, Water slide, Bumper boats, Kid Kountry and Moonwalk. Waterslide Open Daily (Noon- 6:00PM) June 8- Sept 2, 2019 Subject to weather conditions: Must be 72 degrees or warmer to open the Waterslide. Hot dog, chips, small soda, Birthday ice cream cone! Party(s) must be booked at least 2-days in advance, 5- child minimum, all tickets must be used the same day. Bring in your current report card during the month of June and receive ONE FREE GO KART RIDE FOR EVERY "A" Limit 4 free Go Kart rides. Valid for K-12 ONLY. If school uses numeral grades the highest score will equal "A"
July 4th Noon - 5:00pm. Free all day Water Slide Pass for all military and family members. 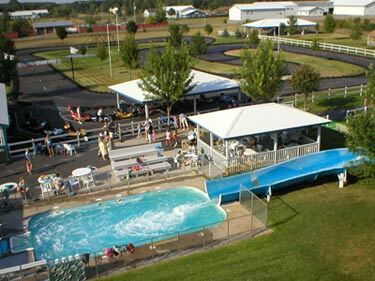 Unlimited Waterslide, Go-Karts, Jr. Karts, Indy Cars, Mini-Golf, Moon Walk and Bumper Boats. Noon - 5:30 p.m. Tuesday June 25th, Tuesday July 23rd, Tuesday August 13th, $19.95 plus tax per person, not valid with any other coupons or specials. WATERSLIDE: - Children must be 40" tall to ride the slide with adult supervision. Go-KARTS: - Children must be 53" tall and 10 years old to drive a Go-Kart/3ft tall and 3 years old to ride with an adult in a side-by-side Go- Kart. MOON WALK: - Adult supervision required for children age 3-9 only.